During the fifteen years José Martí spent in the United States, he wrote several hundred articles on this country, Europe and Latin America for numerous newspapers in Argentina, Mexico, Venezuela and other countries. He also wrote for several US journals, such as The Hour, and The Sun. However, although much attention has been given to his work and his reception in Cuba during the Republic (1902-1959) and the Revolution (1959-present), no research has been done on Martí’s media coverage in the United States before or after his death. (1) Judging by the New York Times' coverage of Martí’s revolutionary campaign, by the time he died in 1895, he had gained considerable attention by the American press. Thus, it should come as not surprise that by the time the Republic was established in Cuba, Martí was little known in the Island, but already known in the U.S. In 1899 his name appeared in a book devoted to True stories of Heroic Lives in the XIX century, side by side with political figures such as Lincoln and Roosevelt and his name also appeared in a book for children entitled Martí: a story of the Cuban war (1899), although the character in the story bares little or no resemblance to him. How then did The New York Times and these books report Martí’s whereabouts in this country while he was organizing the Revolution? 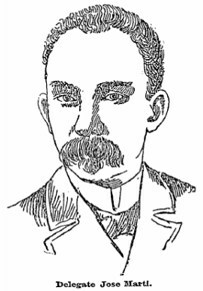 Since 1892 to the year of his death in 1895 and even after his death, Martí’s name appeared several times in The New York Times as well as in other journals. Given the size of the Cuban émigré community in this country, and its scattered condition all over the US, one could argue that these reports found in these widely circulating journals were very important to the cause. They validated Martí’s own campaign for Cuban Independence, and on the other hand, kept Cuban revolutionaries and American sympathizers informed of the state of the war, his plans, and his political promises. In fact, Martí’s own newspaper Patria, served a similar purpose. It addressed and informed the Cuban communities during the preparation for the Revolution. But for the American audience unable to read Spanish or to attend Martí’s meetings, the American press’s coverage of his revolutionary campaign in this country must have been essential. In what follows, I will try to show that by the time the US government decided to intervene in the Cuban war of independence, the The York Times had already talked enough about Marti’s plans, had translated and published at least one of his manifestos into English, had quoted him verbatim, and had kept the public in general informed of the situation on the Island. For the purposes of this essay, I will concentrate my attention on the reference to Martí specifically in this journal and George Reno’s articles. I will begin with the year 1892, that is, the year Martí founded the Cuban Revolutionary Party, and I will end this survey in 1899, the year after the United States entered the war. By doing so, I would like to straighten some biographical information involving Martí’s political campaign in the US and his whereabouts, and I would like to re-publish a document that appeared in The New York Times that has remained unknown since then. A close Spanish version of this document appeared in Martí’s Obras Completas, and according to The New York Times, Martí signed it and distributed in United States, Cuba, and Mexico. On August 27 1892, in the same year Martí founded the Cuban Revolutionary Party, Martí writes in his political newspaper Patria precisely on the topic of “the Cuban independence and the American press”: “Patria hubiera podido y debido acaso, publicar las apreciaciones con que algunos periódicos de más peso del Norte, como el Herald y el Sun, el Times y el Journal of Commerce, comentaron los actos públicos recientes del Partido Revolucionario Cubano” (OC, II 148). However, Martí continues to say, Patria was more interested in the future than what it had achieved in the past, and for that reason, he did not talk about the American newspapers that had published news on the Revolution. Nonetheless, Martí comments on the way a public meeting of the PRC was covered by The Public Ledger of Philadelphia, and he summarizes several paragraphs and ideas expressed in this newspaper. Martí, who was always very conscientious of what was said about Cuba in the press, knew quite well that at certain moment in time during his campaign, it would be necessary to have the American public on his side, a public well-informed and ready to accept the new government he wanted to establish on the Island. Three years before the Philadelphia newspaper published this article, another newspaper, The Manufacturer, had published another one that Martí considered an insult on Cubans. Therefore, every time Martí could directly or indirectly establish a dialogue with these papers, he did so. One of the journals mentioned by Martí in this article for Patria was The New York Times. But how did the NY times cover Martí? On March 7, 1892 this paper reports for the first time on Martí’s campaign for Cuban independence in the US. It says that on March 6, a group of “friends of Cuban liberty. . .promoting a revolution” raised funds for the cause. It reports that several of the revolutionary clubs met in New York, each one represented by their leaders. Juan Fraga, President of the Club Los Independientes, Sotero Figueroa, President of the new club Borinquan, José Martí, president of Jose Marti Club, and Frederick Sánchez of Los Nuevos Pinos were present there. The paper continues to say that “already a large sum of money was in the bank”, and Cuban citizens were just waiting for the word to go to war. It also says that women were represented by the “‘Cuban Ladies’ Club, wives of the many of the leading of Puerto Rican and South American merchants.” Ibrahim Hidalgo Paz in his Cronología Martiana, does not mention this meeting, nor has it been noted in Martí’s bibliography. On July 26, 1892, a month later, the same newspaper reports that the day before, July 25, in Jacksonville, Florida, 1,500 Cubans, Spaniards and Spanish-speaking Americans met. The cause of the meeting was the Cuban Independence. Speakers in the meeting were José Martí, “the exile Cuban patriot now living in New York”, General Carlos Roloff, Lieut S. Sanchez, and J.D Poyo. Martí’s visit, says the newspaper, “was not for the purpose of arousing feeling against Spain, but to organize the Cubans into clubs that would assist the cause of independence with the money when an opportunity presented”. The paper also says that “nearly every member in the US will contribute about $1 per week, making an income of $5.000 each week to the war fund”. Ibrahin Hidalgo Paz in his Cronología Martiana says that Martí arrived in Jacksonville, Florida, on July 23, where he gave a speech to Cubans living there. The New York Times, however, says that the meeting was two days later. Thus, Martí was not probably in Saint Agustin on the 24th of July as Ibrahin Hidalgo says. On Sep 20, 1892, The New York Times publishes another article on the preparation of the Cuban Revolution: “Preparing a revolt: Señor Martí in South America”. The paper quotes Benjamin Guerra, treasurer of the Cuban Revolutionary Party, saying that José Martí, the “grand delegate of the party” was now in one of the South American Republics. The paper stresses the fact that José Martí “was in perfect health physically and mentally” and working. The article goes on to explain why the new revolution was needed and gave several historical facts. Benjamin Guerra says that in New York there were “ten such a clubs” of revolutionary men ready for war. He also says that there were also clubs in Brooklyn, Tampa FL, Jacksonville, Boston, Chicago, Philadelphia, Atlanta, Ocala, New Orleáns, Jamaica and Haití. According to him, smuggling arms and men into Cuba was not difficult because the “Spanish authorities are easily bribed and the Cubans are accumulating a good deal of money”. According to Ibrahin Hidalgo Paz on August 31, 1892, Martí went on a political trip to the Caribbean. He visited Haiti, the Dominican Republic, and Jamaica, where he met important political leaders, and in October 13, 1892 he came back to New York. Six months later, on Apr 15, 1893, it is reported by the same newspaper that the previous Monday had been a very busy day for Cubans in the United States and Mexico. This is due to the fact that it was the anniversary of the republican declaration of 1868 and one year since the new revolutionary party was formed. 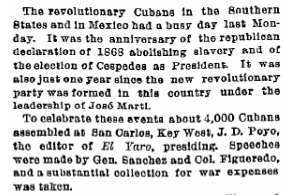 To celebrate these events, 4,000 Cubans assembled at San Carlos, Key West, with J. D. Poyo, the editor of El Yara, presiding. Speeches were made by Gen. Sanchez and Col. Figueredo and a substantial collection for war expenses was taken. The day was celebrated in Ocala, Fl “and several Americans spoke in favor of the movement”. The paper also mentions that “there is a large number of sympathizers in New York, and should the ball be set rolling, there will be a large influx of fighting men to Cuba. A short while ago a club of seventy five young men, pledged to Cuban independence, were drilling regularly in Harlem. They received notice from the authorities that their proceedings were illegal and were compelled to desist, but their organization is not disbanded and they are said to be well armed”. The paper also mentions that José Martí was formerly the Consul General of Argentina in the US, but when “the Home Rule Party in Cuba found that it could not expect any justice from the Spanish Government, Mr. Martí resigned his office and became the chief organizer of the revolutionary party”. On this same article The New York Times publishes two pictures: one of José Martí and the other one of his secretary Gonzalo de Quesada. A month later, on May 3, 1893, the New York Times publishes in its first page another article about Martí and the revolution. It says that on May 2, in Key West: Cubans had an “enthusiastic meeting”, that they are ready to fight and waiting in Florida to sail. The newspapers quotes “Gen[eral] José Martí” saying that: “independence of Cuba will be achieved in 2 years.” That same day, a report from Havana published also in the same newspaper that there were rebels between Puerto del Padre and Manati districts, but no fighting yet. Another news that day from Madrid states: infantry and cavalry “in pursuit” of rebels. It says that there were 5,000 men in Spain ready to go to Cuba. On the same day another report from New Orleans says that there was a “slight disturbance [...] near Holguín district of Santiago de Cuba”; that the district was placed in “estado de guerra.” Troops between Havana and Matanzas occasionally “exchange shots” with a “brigand”; “this is about all the revolution amounts to.” Also on May 2, the newspaper publishes a report from Washington. It says that the State Department is “ignorant officially” of Revolution in Cuba. Assistant Secretary Adee believes it is nothing more than the “banditti” system. there is undoubtedly a revolutionary movement worthy of consideration in Cuba. The Spanish government has kept very closed watch over all communications from the island, thus revealing the gravity of the affairs. The news about the outbreak from Key West, although true, seems to be exaggerated and somewhat confused. The Cubans in Key West are very enthusiastic, and are anxious to help their country in the establishment of a working and lasting republic, and they will do their duty in such a way as to please all true men of America. It seems that the fighting is going on in Las Villas, and that two provinces have joined the movement. As part of the article The New York Times says that Mr. Trujillo, the editor of El Porvenir, a newspaper published in New York, “cabled yesterday to the editor of La Lucha of Havana, asking him for information about the reported insurrection, but waited a long time without getting an answer. This led Mr. Trujillo to infer that an insurrection had broken out, and that the Spanish government was taking steps to prevent correct news from being sent from the island.” According to Ibrahim Hidalgo Paz, on Nov 13 Martí was in Philadelphia where he gave a speech and talked about some inaccuracies published in this city press. On November 4, a small number of Cuban rebels had attacked the Spanish Army in Las Villas, but the uprising was soon neutralized and the rebels disbanded. Martí seemed to have talked to the media about this uprising. In his own words, it showed to the Americans and the Cubans in general that Cubans were “enthusiastic” and “anxious” to fight. The delegation for the Cuban revolutionary party has just returned from a trip made to accelerate our work in foreign lands in order that we may be ready at any moment to begin the war. Our words are not idle vaporings. We mean life or death. We must prompt by the opportunity now offered to secure the independence of our country. We must work with secret energy or our plans will be on danger of being defeated. According to Enrique Trujillo in Apuntes históricos, at the end of the month of July, 1893, José Martí distributed among the different Presidents of the Clubs that comprised the Cuban Revolutionary Party a “secret document,” that was nonetheless later published in the revolutionary newspaper El Yara, in Key West (148). The editors of Obras Completas, (Havana, 1967-1973), reproduced this document in volume II, page 358. Rafael Diaz’s document is probably a translation of one of those copies distributed among the head of the clubs, since the ideas and the intentions in both documents are the same and the phrases unquestionably Martian in style. Furthermore, both letters begin the same way and some of these phrases are literal translations from the other. One of then reads in Martí’s Spanish version: “somos un ejército de luz y nada prevalecerá contra nosotros” (OC II, 359). In the letter from San Antonio, Texas, it reads: “We are an army of light. There is no surprise or discord that can check our march to victory.” However, in the document the New York Times published, Martí’s protagonism is not that visible and only the “delegation” appears to have issued it. After two other reports on Martí, on Feb. 28, 1895 and April 20, The New York Times reports on the first page, (May 22, 1895) that the day before, José Martí was confirmed dead in Havana and that Gomez was seriously wounded. However, it also says that some think Gomez didn’t come to Cuba at all and that Martí sent someone else under his name. Martinez Campos, a Spanish General fighting against the rebels, returns from Cienfuegos and goes to Manzanillo, and there he meets with chiefs of the Reformist Party (Conte de la Mortera) and the Autonomist Party (Galvez, Montoro, Giberga and Cueto.) Campos gives a press conference, and proclaims Jovito battle a “brilliant victory.” “Clemency is the watchword of Spain’s troops.” The paper also says that the autonomists were expected to have a majority in the elections. On May 23, 1895, The New York Times reproduces a cable from Havana that confirms Martí’s death. On May 23, the NY Times publishes a cable from Madrid confirming Martí’s death and describing him as “President” “of the imaginary Republic of Cuba.” On May 28, 1895, the paper echoes a report from Havana: Marti’s body had arrived at Santiago de Cuba after a train escorting it was attacked four times by rebels. His body was buried at Santiago de Cuba. After the article appeared in The New Voice it was reproduced in True Stories of Heroic Lives: Stirring Tales of courage and Devotion of men and women of the nineteenth century (1899), where there were also other stories on the Cuban war of independence, including two written by Reno himself on the characters of Gen. Máximo Gómez and Gen. Antonio Maceo. His article on Gomez is particularly interesting because besides being a very sympathetic portrayal of the generalissimo, it also stresses the fact that there were racial and political differences among the Cuban émigré community. Summarizing then the reports concerning Martí’s campaign in the U S, we could reach several conclusions. First, Martí becomes “a news” in this country the moment he was elected the “grand delegate” of the Cuban Revolutionary Party. Thus, Martí is first and foremost regarded in the media as a politician, a man of ideas and value in support of Cuban independence. The New York Times focuses its attention on his meetings and the collections taking place all over the country. It gives the public a sympathetic portrayal of the revolutionaries, although it also published at least one article written by a Spanish priest condemning the war, and another article from “a special correspondent from Havana” attacking Martí’s role and character in the Revolution. However, Martí “the revolutionary” is what appears the most in these reports and they give a fairly good depiction of the situation and organization of the events evolving in the country. On the other hand, George Reno’s characterization of Martí as “an intellectual meteor” inagurates a new characterization of the hero in the media and the United States. Martí from this moment on will be regarded as something more than a revolutionary. He will be the “genius born of the people” who reached an untimely death in Dos Rios. 1 For essays on Martí’s reception see Ottmar Ette’s José Martí. Apostel-Dischter-Revolutionär. Eine Geschichte seiner Rezeption. (Tübingen, Germany: Niemeyer, 1991) and more recently the articles compiled under the title The Cuban Republic of José Martí. Reception and Use of a National Symbol. Edited by Mauricio A Font and Alfonso W.Quiroz. (Oxford: Lexington Books, 2006). Barnes, Annie Maria. Martí: a story of the Cuban war. Elgin, Ill., D.C. Cook Pub, 1899. Hidalgo Paz, Ibrahim. “José Martí: Cronología 1853-1895”. Obras Completas. Iconografía. Cronología. CD-ROM, Centres of. Centro de Estudios Martianos, 1995. Martí, José. Obras Completas. 28 vols. La Habana: Editorial Nacional de Cuba, 1963-75. Reno, George. “Jose Martí, ‘the Master’”. True stories of heroic lives: Stirring Tales of Courage and Devotion of Men and Women of the Nineteenth Century. New York: Funk & Wagnalls, 1899. 311-320. _____. “A character sketch of Gen. Máximo Gomez” True stories of heroic lives: Stirring Tales of Courage and Devotion of Men and Women of the Nineteenth Century. New York: Funk & Wagnalls, 1899. 165-181. Trujillo, Enrique. Apuntes históricos; propaganda y movimientos revolucionarios cubanos en los Estados Unidos, desde enero de 1880 hasta febrero de 1895. Nueva York, Tip. de "El Porvenir", 1896. El Partido Revolucionario Cubano se formó en Cayo Hueso y Tampa a principios de 1892. De regreso a Nueva York, Martí quiso integrar en el partido los grupos del exilio que allí lo apoyaban. A ese efecto se celebró una reunión de cubanos y puertorriqueños en el Military Hall, del Bowery. Por ese acto aparece en The New York Times por vez primera el nombre de Martí; dicen los titulares del 7 de marzo que se promovía una revolución y que los partidarios de la libertad de Cuba recaudaban fondos para la causa (Promoting a Revolution. Friends of Cuban Liberty Raising Funds for the Cause). Mientras en Washington crecía el impulso expansionista, entre los cubanos aumentaba el número de los que estaban a favor de la anexión de Cuba a los Estados Unidos; un artículo en el periódico anunciaba a grandes titulares el 2 de agosto de 1892: Cubans Favor Annexation. Martí, antiimperialista, se lanzó entonces con mayor fuerza a torcer el ''destino manifiesto'' que de tiempo atrás se anunciaba para su patria. A partir de ese momento, The New York Times sigue a Martí en su campaña por la Florida. Desde Cayo Hueso informa un corresponsal sobre su llegada procedente de Tampa. Lo recibió en el muelle una multitud de cubanos, recorrieron las calles precedidos por una banda de música y se dijeron discursos sobre el progreso de la conspiración en la isla. Luego, en Jacksonville, mil quinientos emigrados fueron a escuchar a Martí. A partir de entonces el periódico se refiere con frecuencia a Martí como el ''general Martí'' (Gen. Marti). El 12 de marzo de 1893, desde Cayo Hueso afirma que la marina americana tenía listos dos cruceros para impedir una expedición armada a las órdenes de Martí (It is positively known that Gen. Marti will go with the expedition against Cuba); y con espíritu de burla reproduce la noticia de que los cubanos hacían prácticas militares en la playa, y que cuando no tenían fusiles llevaban escobas al hombro (If the supply of guns runs low, brooms are substituted). Cientos de dibujos, quizás miles se han hecho de Martí. Que se sepa, el más antiguo es el que aquí se ofrece. Apareció en el periódico el 15 de abril de 1893 con una reseña de actos en San Agustín, Ocala, Tampa, Cayo Hueso y en el Hardman Hall, de Nueva York: era por el aniversario de la fundación del Partido Revolucionario Cubano. Otro aporte curioso que aparece en The New York Times es la traducción de un escrito de Martí anunciando el progreso de los planes para la guerra. Con el apoyo del general Máximo Gómez, en Santo Domingo, Martí estaba muy satisfecho de haber logrado también el del general Antonio Maceo, en Costa Rica. Escribió así una circular que el periódico tradujo y publicó en parte poco después: ''Somos un ejército de luz'', decía el original. ''No hay sorpresa ni desacuerdo que pueda detener nuestro camino hacia el triunfo. Los héroes de Cuba hoy trabajan juntos ¡Bendita sea nuestra patria!'' (We are an army of light. There is no surprise or discord that can check our march to victory The Cuban heroes are working together God bless our country!). Iniciada la guerra, tres días después del Grito de Baire, en un despacho desde La Habana del 27 de febrero de 1895, The New York Times tilda de arrepentidos y cobardes a los que habían preparado la insurrección (Cuban Rebels Penitent. Those Who Were Fierce in New York Are Like Doves Elsewhere). El 1 de abril desembarcaron cerca de Baracoa Antonio Maceo, Flor Crombet y 21 hombres; y diez días más tarde, cerca de Santiago de Cuba, Martí, Gómez y sus 4 acompañantes. El 22 de abril, para desprestigiar la revolución dice el periódico que los insurrectos eran casi todos negros, con jefes incapacitados, y que el general Maceo se había suicidado (Cuba's Rare Insurgents. Mostly Negroes, With Poor Arms and Incapable Leaders. Maceo Kills Himself in Chagrin). La noticia de la muerte de Martí la dio The New York Times el 21 de mayo. Tiempo después repitieron una infamia que empezó a circular a raíz de Dos Ríos: que hombres de Maceo, siguiendo sus instrucciones, lo habían asesinado. Después informó el periódico sobre el traslado del cadáver a Remanganaguas, a San Luis y al cementerio en Santiago de Cuba. De nuevo allí lo identificaron, y con cierto sarcasmo el periódico afirma que desde el punto de vista legal, y en toda la extensión de la palabra, ''el incomparable Martí'' estaba muerto (The one and only Martí is literally and legally dead).